Are you bored with the rummy offers? 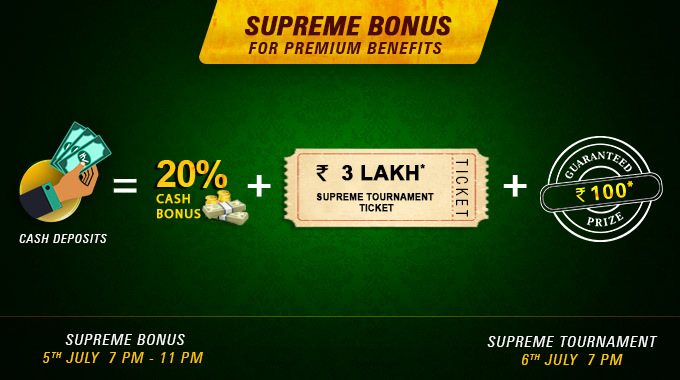 Here is an amazing Rummy Circle bonus which is named ‘Supreme’ for a reason. Rummy Circle offers this amazing deposit bonus where you get 20% deposit bonus in addition to an exclusive ticket to the ‘Supreme Tournament’ and a guaranteed cash prize! Now, this is what we call a Bonus! All you have to do is deposit cash on the promotion period and you get access to these offers. Rummy Circle offers players with the most innovative and exciting offers in your best interest. So if you are looking forward to deposit cash into your Rummy Circle account, make sure you deposit it on Tuesday and avail this amazing offer. All you have to do is to deposit an amount of Rs 500 or more in the Rummy Circle account this Tuesday (5th July 2016). The time for depositing the amount is between 7:00 PM and 11:00 PM to be eligible for this amazing bonus. While depositing the amount, you should enter the promo code. The promo code for this bonus is SUPER23. Please note that you will be eligible for a bonus of 20% of up to Rs 750. While you make a deposit, you are also entitled to enter the ‘Supreme’ Tournament for free. Please take note that you need to register for the tournament in advance as the seats are limited to 2,000 for the tournament. To register for the tournament you need to register on the Rummy Circle website between 4:00 PM and 6:55 PM on this Wednesday (6th July 2016). The tournament will start on 7:00 PM, the total prize pool of the tournament is Rs 3 Lakh. The 1st prize of the tournament is Rs 20,000 and you get a minimum guaranteed prize of Rs 100 by participating in this tournament. Please note that this amazing bonus is valid only for the club players of Rummy Circle. So do not miss this amazing tournament. Go straight to the Rummy Circle and make a deposit and utilize this amazing tournament. If you have any suggestion and reviews on Rummy Circle tournaments, please do let us know. Also let us know how this tournament went for you.